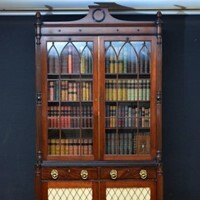 Superb Victorian rosewood, double bookcase stamped by A. Blain, Liverpool. Having stepped and swept moulded cornice above 6 height adjustable shelves all flanked by drop carvings, projecting base with frieze drawer and panelled cupboard doors enclosing 6 sliders, flanked by carvings, all standing on plinth base. This fine antique bookcase is in fantastic condition throughout and it comes with original cabinet maker invoice dated 1861. 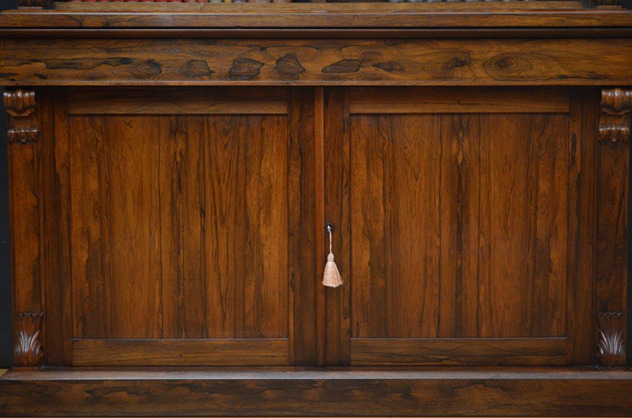 We are experienced antique furniture dealers based in Derbyshire, who specialise in Georgian, Regency, Victorian and Edwardian furniture, established for over 35 years.